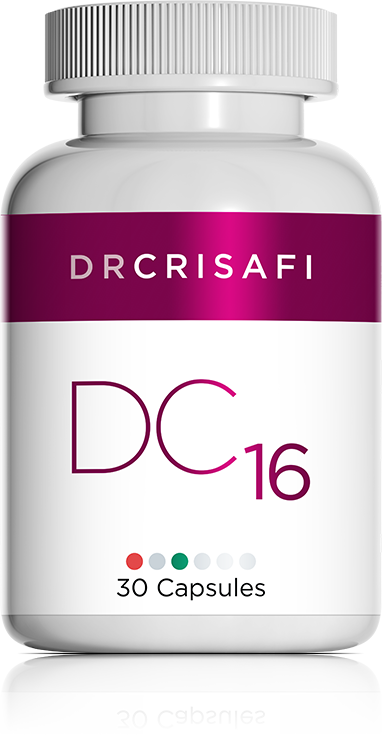 DC 16 is a nutritional formula that promotes the repair of epithelial cells: skin and mucous membranes (genito-urinary, intestinal and respiratory). This formula is particularly useful in repairing mucosae following an infection or any other chronic and/or frequent inflammatory process. When an individual suffers from chronic infections, the mucosae can become fragile. This formula helps compensate for the various "attacks" on the mucosae and skin. It is also very useful in treating certain degenerative disorders affecting these types of tissue. L-Glutamine is an amino acid whose role includes the repair of mucosae, skin and muscles. N-acetyl glucosamine is a substance that is necessary for cartilage formation. More specifically, it promotes the repair of epithelial cells (mucosae and skin), as well as veins and arteries. The artichoke and fructooligosaccharides help thicken the mucosae, particularly of the intestines, and promote the regrowth of intestinal flora. May be used in conjunction with DC 13 for cystitis, DC 14 or DC 55 in the case of a recurring respiratory or gastro-intestinal infection, and DC 34 in the case of vaginitis. May be used in conjunction with DC 53 to boost its effectiveness for skin problems.